A couple of weeks again while strolling down memory lane and revisiting my trips to Argentina, I mentioned how I have used Dulce de Leche to add an extra treat to brownies. It is a very easy thing to do – just prepare you favorite brownie recipe or mix as usual and then swirl in some Dulce de Leche just before baking. The result is a gooey delicious treat. If you don’t want to experiment but you like the idea of Dulce de Leche brownies, may I suggest you try the Buenos Aires Brownies from Zingermans Bakehouse. I’m sorry, but these brownies sound delicious and may be just the thing to hold me over until I get to Buenos Aires again for some local treats. Check out Zingermans Bakehouse’s Buenos Aires Brownies and other treats here. 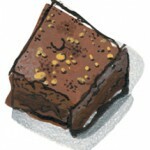 Order your Zingermans Bakehouse Brownies here. I have posted a few bits and pieces here and there about my work as an artist. My medium is what is more or less best known as “assemblage” – but could also be called “constructions” or “found art” or many other things. This is where I take bits and pieces of collected and found objects and re-imagine them into a new piece of art. For months now, ever since I began my sabbatical experiment, I have been working in my New Hampshire studio on many pieces and plan to display some finished works soon. Lost Cowboy fans will be the first to see the work here, and I hope to exhibit my work at galleries and festivals over the summer. All that said, I think I may already be a professional artist. Last summer, shortly after the Boston Bruins won the Stanley Cup, I put together a very simple assemblage from a couple of found objects. Many of my works feature mid-century artifacts like bits and pieces of toys long discarded by aging Baby Boomers. When I was thinking about the Bruins win my mind turned to a couple of object I knew I had that would make a nice little tribute. 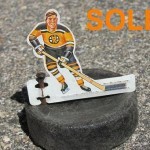 One piece was a little metal Bruins player off of an early 70’s vintage tabletop hockey game. The second piece was a well used street hockey puck from roughly the same era. I simply drilled a hole in the puck and attached the player with a screw and I had a very simple sculpture. I brought the creation with me as a mascot to Todd Farm where I was set up selling my usual collection of vintage finds. My little Bruins guy was quite the object of conversation and many people asked how much he was. I said he was NFS – not for sale. One of the people who wanted to buy it returned later in the day and asked again. He said something like “come on, everything has a price.” I thought about this, and thought I would indeed give him a price thinking that he would never pay so much. He said: “fine” and handed me $40 and I was left speechless and became a newly minted artist. I assure you that my other artwork is not so simple and takes me much longer to create. However, it will always be this simple and timely creation that will be my first sale as an assemblage artist. It is a dismal winter’s day here in New Hampshire – the good news is it is the perct day to sit by the fire with a good book (or Kindle) and read away the afternoon. I love old stoneware and have a few pieces around the house serving various purposes: holding kitchen utensils, hiding bathroom cleaner, storing pens and pencils, etc. I like Red Wing’s collection of crocks, which come in various sizes and offer a nice variety of opportunities for use around the house. 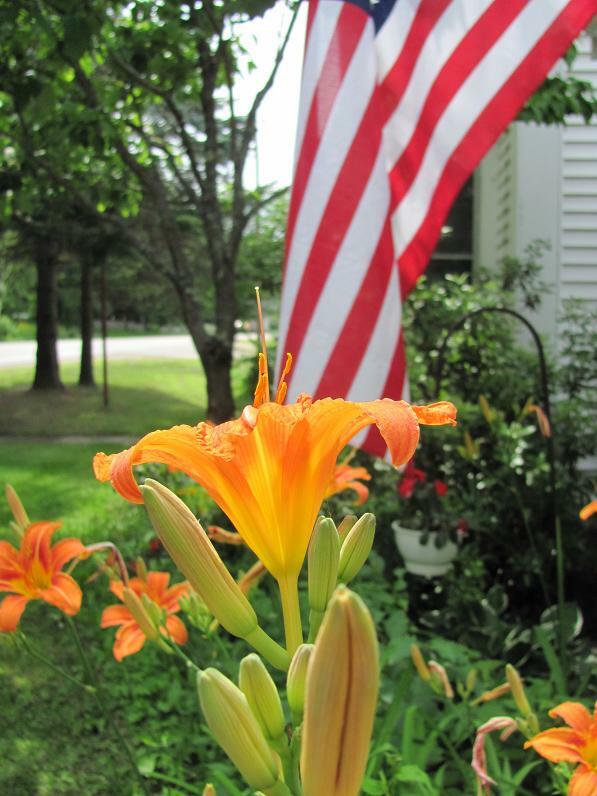 I am a big fan of celebrating and supporting companies – like Red Wing Stoneware – that are still producing traditional products in the good old Unites States of America. 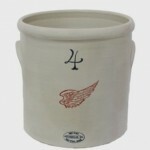 Visit the Red Wing Stoneware website here. Last week I provided some postscripts from my trip to London in November. I continued browsing through my notes and realized that I had not posted about many things I “found” on the Italy leg of the same trip. 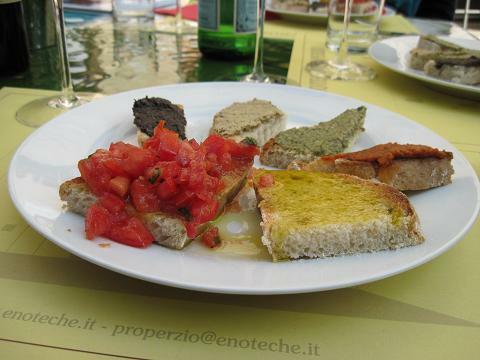 So as today’s “Postscript” for a cold Friday in January, I am going to share some of these Italian finds with you. The big revelation for me on my trip to Italy was the discovery (to me anyway) that not all balsamic vinegars are created equally. 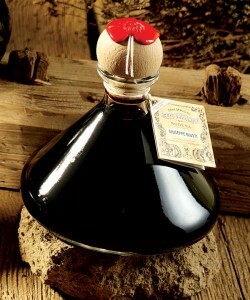 I have had many varieties of balsamic through the years and was a little dubious when presented with the 30-year-aged balsamic vinegars of Giusti. OMG! I was tasting a whole new world – new taste buds awakened on my tongue. But alas, the €80 for just a few ounces made me think I can’t obsess about Giusti, but make a note of it for a future special occasion. While in Rome and Florence I enjoyed watching all the scooters in the streets. I have always had the fantasy of driving a scooter around Rome (ala Gregory Peck and Audrey Hepburn in Roman Holiday), but when I saw how scary that actually was in the crazy Roman traffic, I decided to stay on the sidewalk. But I love the whole scooter thing, and in particular I love the look and culture surrounding vintage Vespas. I satisfied my Vespa thing by taking a lot of pictures of the scooters in the streets and by buying some postcards featuring vintage Vespas – much like what you can see and purchase at Café Press. While in Florence, I fell in love with the amazing leatherwork that is synonymous with Tuscany. In particular, I loved the leather-bound books and journals found in the many stationary stores I popped into. I purchase some lovely Italian-made stationary at on these stores made by Sogni in Carta, “a company that makes products in leather and hand painted Florentine paper using methods inspired by traditional Tuscan workmanship.” Very cool stuff. To balance my afore mentioned balsamic crush, I also formed strong feelings for many of the local olive oils I tasted on the trip to Umbria and Tuscany. One of the best of which was the Extra Virgin Olive Oil of Azienda Agraria, which was drizzled over a particularly good caprese salad while dining in Spello, Umbria. I couldn’t end this postscript post without mentioning the candy of Amarelli. Although I am not the biggest candy fan, Amarelli makes the most exquisite looking candy and very Italian at that. Most of the Amarelli candies come packaged in very neat little tins. Very cool. In recent years I have been keeping my notes on cooking and recipes online or in files on my laptop. As a result, I am often balancing the computer on the counter trying to see the recipe, and sometimes trying to refresh the screen with my elbow when my hands are covered in some sort of dough. I often think – there must be a better way! Of course there is and that is the way people have kept their recipes for years – in a genuine recipe box. My mom has a recipe box, a well used metal note card box, which she has carefully curated for decades with note cards of her classics and the occasional magazine clipping or notes from friends. Looking through her recipe box is like taking a journey through the past remembering all the times my mom made a special treat or a favorite dinner. In fact, there is a recipe in there for something called “Favorite Dinner” – something my mother through together one night when we were kids, we loved it, and a tradition was born. Anyway, I don’t think my online recipe source will ever be replaced by going back to note cards, but I do like the idea of creating an old school file with a set of my most often used recipes to keep in the kitchen for quick reference. Meanwhile, I found some nice upscale recipe boxes at Jack and Lulu. I think I will be looking for a vintage box to house my recipes, but I absolutely love the idea that recipe boxes, like the ones offered by Jack and Lulu, are alive and well. For some reason I have been going through my library of books this winter and re-reading some old favorites. I love picking up a book I remember loving years ago and reliving where and when I read it – kind of like visiting an old friend. Perhaps it is like a comfort food, which may explain why winter has brought this on. 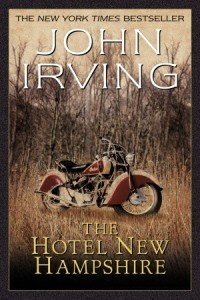 Anyway, I just finished reading The Hotel New Hampshire by one of my literary idols, John Irving. This was the first book by Mr. Irving that I read and I have pretty much read everything he produced before and since. I have loved many of his works (The World According to Garp, The Cider House Rules, A Prayer for Owen Meany, et al) but it is The Hotel New Hampshire that is still my favorite. I was in high school back in the 1980’s when I first read this book and remember having a sort of awakening – this was an adult literary book and I found it accessible and amazing. I haven’t been the same since. Mr. Irving, much like Charles Dickens, manages to create an amazing cast of characters described vividly and doing interesting things, with plots seemingly incidental against his creative backdrop. I am not sure if the Dickens comparison have been used before by literary critics or if others think it is apt, but it is how I see Irving’s work, after all he does make reading about orphans entertaining. Anyway, The Hotel New Hampshire is a great entrée in the work of John Irving. I found the book as enchanting as I did all those years ago. The world he creates and the people living in it are funny, damaged, tragic and everything else that makes us human – and there is a great dog to boot! It has occurred to me that my love for this book could be partly due to the fact that “New Hampshire” (my home state) features prominently in the title and story. I think back in the day that was something that intrigued me and made me pick it up in the first place. However it was that I found this book I am just so glad I did as a whole new world opened up for me. I developed a lifelong love for the work of the author, and more importantly, rediscovered the joy of reading I thought I had exhausted as a child. The Hotel New Hampshire is available from Amazon and other booksellers. It was almost 40 degrees today at the base of Mount Chocorua in Tamworth, NH – what folks around here refer to as the “January Thaw” even when it has been an unusually mild winter. The warm temperatures, and rain over night, caused puddles on the lake. Once again the mountain and lake create a different look than I’ve seen before. I love the dramatic dark cloud sharply contrasting with the patch of blue sky – the latter of which can be seen reflected in the puddles in the foreground. 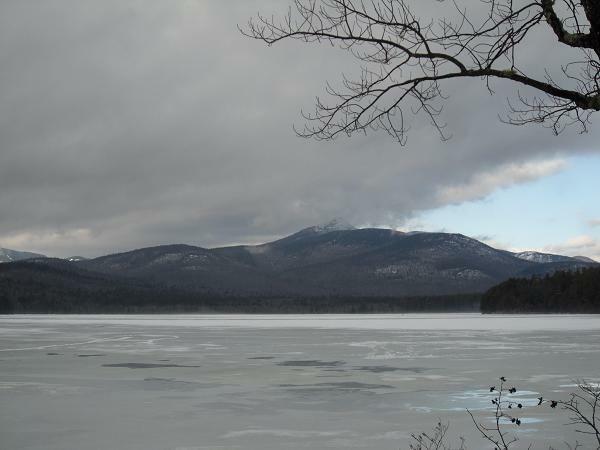 Sadly, the thaw, rain and relatively low snow pack has also postponement this weekend’s planned annual sled dog races that usually start in the middle of frozen Lake Chocorua. Planners hope to be able to reschedule the races later in the winter. I don’t golf, but I often thought about taking it up, but in the end I am too lazy to commit to it. So I will stick with miniature golf, which I stink at, but enjoy from time to time. Anyway, I thought about golf recently when I cam across the amazing luggage of Club Glove. Club Glove is a company that made its name in producing top-of-the-line golf bags and related products for golfers. With their success in the golf world, Club Glove turned their attention to things like luggage and they make some really nice pieces. I saw a set of Club Glove’s three piece travel system while traveling in November, and I coveted it. It is great stuff and the system is so cool with three good size pieces connecting to make navigating to and from the airport a breeze. The price point on Club Glove’s afore mentioned “Three Piece Ensemble” is a little over this starving artist’s price point, but I am officially placing it on my wish list should I come into money or have to register for impending nuptials. The fact that your Lost Cowboy hasn’t had a date in nearly a decade makes the latter highly unlikely, but I love the luggage! See all the fine products of Club Glove here. It was a very cold and snowy weekend up here in the hills of New Hampshire, and to top it off, I had some trouble with the furnace/boiler at the old family homestead. Between visits from the heating guy, and periodic trips down to the basement to do a few things needed to get the boiler through a few days before repairs and replacements could be made – I was in desperate pursuit of a diversion. While puttering around I came across my new Cuisinart Enameled Cast Iron Covered Casserole, which I just had to have but had not yet used. When I saw this baby I knew I found just what I needed to enjoy the weekend. 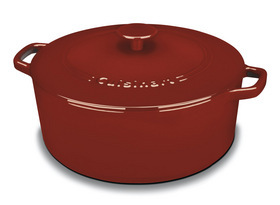 I love this piece of cookware – the Cuisinart Chef’s Classic Enameled Cast Iron 7 Quart Round Covered Casserole – it is pretty to look at and when you feel it’s weight you know it is just perfect to prepare a stovetop meal. 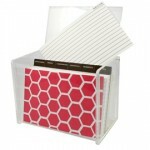 I purchased the 7 Quart Round Covered Casserole in red and it looks great. So back to my weekend meal. I wanted to cook a complete meal in my new cookware, so I went to the freezer to see what I had on hand. I discovered I had a nice 5 pound whole young chicken and knew it would be perfect. I defrosted the chicken using the cold water replacement method and I was good to go. I had some potatoes on hand and a few other things and I went to work. Prepare chicken – remove giblet package, rinse, pat dry, put aside. Wash and peel potatoes, cut potatoes in quarters, set aside. Cut ends off onion, remove outer skin, place onion inside the chicken’s large cavity (seriously, this is the key). Heat small amount of olive oil in the pot on medium/high heat. Once oil is hot, place chicken in pot breast side down, sear the breast until light brown then turn breast with tongs so breast side is up. The idea is to just brown the chicken a little on the outside. Arrange the potatoes around the chicken breast in pot. Pour chicken broth over exposed breast. Sprinkle garlic and desired spices over chicken. Cover pot tightly, keep on medium high approximately 15 minutes, reduce to medium and continue cooking for approximately 45 minutes. If desired, when cooking is complete, remove cover and place pot under the broiler for a few minutes to brown (this makes for a prettier presentation). Remove chicken and potatoes from pot, arrange on platter and serve. I served this with some broiled asparagus, so I cheated on the one pot meal thing, but it was a nice side dish. I saved the liquid in pot to use as a starter stock for soup, which can be made right in the same pot. OK, I am not a good recipe writer, but this is exactly step-by-step what I did the other night. I always encourage experimentation, and I think this basic recipe can be adapted in many ways to suit your tastes. Anyway, I love my new cookware and can’t wait to break it out again. Lost Cowboy is powered by	WordPress 5.0.4 and delivered to you in 1.284 seconds using 58 queries.